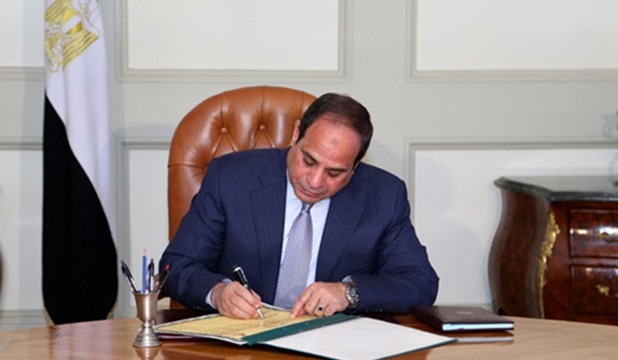 Egypt’s President Abdel Fattah al Sisi signed off on Tuesday a legislation to establish the Supreme Council to Combat Terrorism and Extremism to act as an independent body with all technical, financial and administrative powers, state news agency MENA reported. The law, earlier passed by the parliament and approved by the cabinet, stipulates that the council will be entrusted with mobilizing institutional and community support for countering all forms of terrorism, as well as drying up its sources of funding. The new council will be chaired by Sisi and comprises members of the head of General Intelligence, the speaker of the House of Representatives, several ministers, the prime minister, Al Azhar’s Grand Imam, the Pope of the Coptic Orthodox Church, and several ministers. The council’s main location will be in Cairo, and its head is set to hold a meeting every two months, MENA reported. The new independent body will have the authority to issue binding decisions on counterterrorism measures while aiming to fast-track terror cases through the court system. According to the provisions of the law, which will be published soon in the official gazette, the new council will act as a substitute for the national council for combating terrorism and extremism formed upon the presidential decree no. 355 of 2017. The council will set a strategy to mass all state institutions in an effort to eradicate both external and internal terrorism without messing with human rights, MENA reported. Additionally, the council’s function is to amend educational curriculums to spread ideas of citizenship and tolerance in schools and universities, as well as move to set up a regional coalition of Arab countries to exchange information and boost cooperation in fighting terrorism. Egypt has been battling an Islamic State-led insurgency in the Sinai Peninsula that has killed hundreds of soldiers and police officers since 2014, though attacks have increasingly moved to major cities in recent months. The new law comes amidst Egypt’s ongoing Operation Sinai 2018, launched “to implement the plan of comprehensive confrontation of terrorist and criminal elements and organisations in North and Central Sinai, and in other areas in the Nile Delta and desert areas west of the Nile Valley,” according to the armed forces.